There is no perfect outdoor project – in a vacuum that is. The perfect outdoor living space for one family will likely be completely different than the perfect outdoor space for another family. The perfect space neither has the ultimate features nor the most features — but it has the right features for that family. This family wanted a porch that would provide a wide range of family entertainment. They wanted it to be suitable for dining but also for entertaining. As is quite common now, they wanted distinct areas of the porch both for eating and for seating. This makes your porch a multi-functional space that allows different uses at the same time. If you want to curl up with a book in front of the fire but someone else in your family wants to sit at the table with a newspaper and cup of coffee, this screen porch will accommodate both objectives. In addition to a multi-functional area, this family was certain they wanted an outdoor fireplace both for warmth and for ambiance. They wanted bug protection while enjoying their space. They had a lot of trees on their lot and they wanted protection from debris. 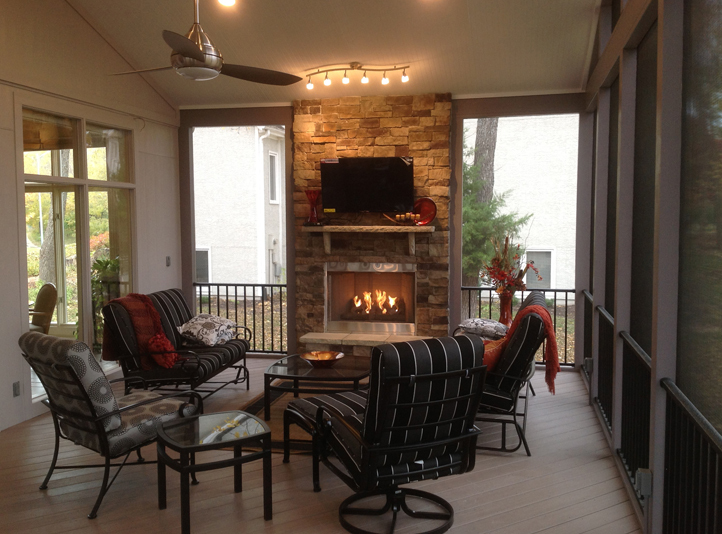 Across the board, a large screened porch fit the bill for how they wanted to live outdoors. When we went to work, we demolished their old deck and built the new gable roof screened porch in its place. We always pay special attention to making sure the structures we build look original to the home. There are several areas that factor into that equation – one of which is the roof. The family was looking to re-roof the entire house and we were able to arrange to have a contractor roof the porch and the remainder of the house at the same time. Their porch floor is made from AZEK Silver Oak color. This PVC floor is low maintenance and carries a 25 year warranty. It will neither need to be painted nor stained. It will not need the annual maintenance that a wood floor often requires. The outdoor fireplace is the showpiece of this porch. 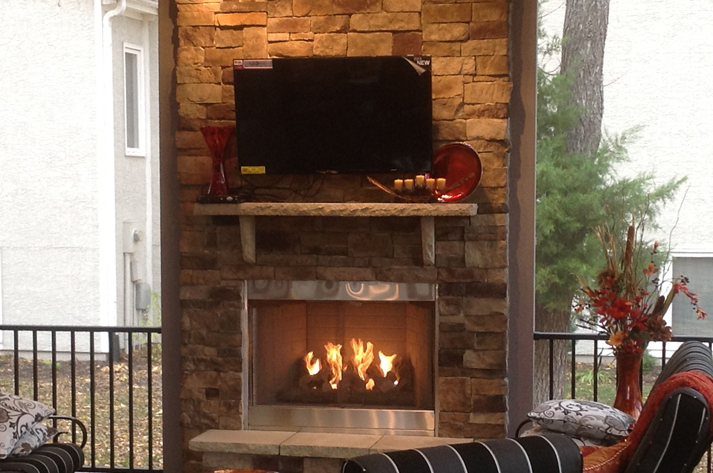 It’s a natural gas outdoor fireplace finished with a stone veneer. 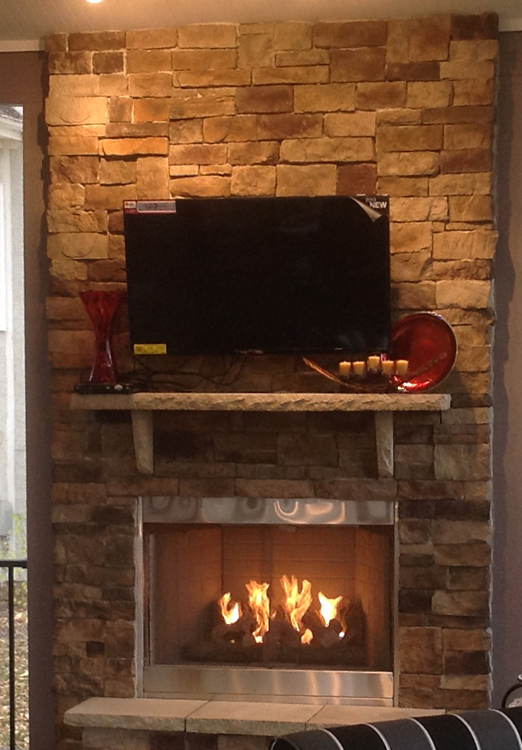 Natural stone is used for both the mantle and the hearth. If you are considering adding a custom outdoor space that’s designed for how you want to live, give us a call for a free consultation at (913) 851 – 3325 or drop us an email at kansascity@archadeck.net. Our consultation is no charge. We look forward to your call. This entry was posted in Outdoor fireplace, Screen Porches on December 4, 2013 by archadeckkansascity.